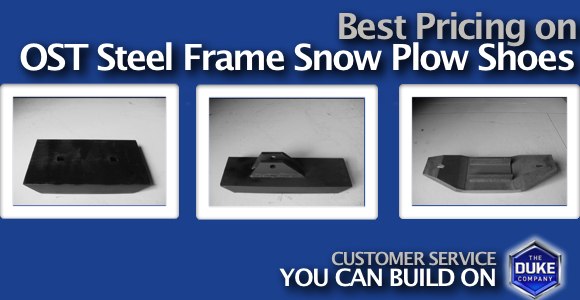 Are you looking for a quote to buy OST Steel Frame Snow Plow Shoes in Rochester NY, Ithaca NY and Western New York? The Duke Company, a New York leader in Ice Control Products proudly carries Steel Frame Shoes that are flat, Steel Frame Shoe Boats for Frink Model #640 Snow Plows and Steel Frame Shoes designed for Tenco snow plows. Prompt service, exceptional value. Call the Duke Company. For prompt service and exceptional value. Call the Duke Company.